The EU steel market remained on a relatively fast growth track in the second quarter, supported by healthy economic fundamentals and the good operating performance of steel-using sectors. Nonetheless, imports continued to grow much faster than the domestic deliveries of EU mills. 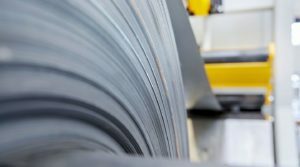 “Growth is stabilising in EU steel markets, in line with expectations”, said Axel Eggert, Director General of the European Steel Association (EUROFER). “However, the various challenges facing the sector will impact us in the coming months. Trade tensions could clearly upset the market’s balance, as could slowing demand in other parts of the economy”. EU28 apparent steel consumption grew by 4.4% year-on-year in the second quarter of 2018. Healthy levels of real steel consumption, in combination with stockbuilding in the steel distribution chain in this period, led to this growth. In the second quarter of 2018 domestic deliveries from EU mills to the EU market rose by 3.7% year-on-year. Third country imports rose by 9.8% compared with the same period of 2017 and surpassed the already extremely high level of imports registered in the first quarter of 2018 by almost 5%. The share of imports in EU apparent consumption rose from 23.2% in the first quarter to almost 25% in the second quarter. The continued, marked increase in import supply in the second quarter appears to confirm previous concerns about third country exporters pushing extra volumes to the EU market in anticipation of safeguard measures, and a willingness of buyers to take certain speculative risks. EU steel market fundamentals are expected to remain supportive to a continued but moderate increase in apparent steel consumption. However, ongoing trade frictions with the US, and cooling global demand, suggest that external risks could continue to climb, which in turn would increase uncertainty and lead to weakening prospects for EU steel users. Moreover, other trade barriers which are being considered by the Trump administration, such as tariffs on EU automotive exports to the US, could lead to a further escalation of the trade dispute and have a damaging impact on steel demand. Nevertheless, EU apparent steel consumption is forecast to rise by 2.2% in 2018 and by a further 1.1% in 2019.
Business conditions in the second quarter of 2018 were similar to those in the first quarter of the year. All steel-using sectors in the EU except steel tube industry registered a solid increase in production activity. Prospects for the EU steel-using sectors in 2018 and 2019 are rather favourable. Despite a mild moderation in economic momentum, framework conditions for steel using sectors are expected to remain supportive to continued but somewhat slower growth of production activity. Domestic demand rather than exports will be the main engine of growth over this period. However, the global economic context has become more uncertain due to rising protectionism and the risk of escalating trade tensions. This might have a negative impact on business confidence and investment. Output in EU’s steel-using sectors is forecast to grow by 3.5% in 2018 and by 1.8% in 2019. GDP data for the second quarter of 2018 showed the continuation of slower but steady economic growth in the EU. While investment rebounded strongly from its weak first quarter performance, there was a negative contribution of net trade, in spite of a recovery in exports. This suggests that the downside risks for exports have begun to materialise, as a consequence of the current slump in international trade and a delayed impact of the stronger euro. Although confidence indicators weakened slightly further in the third quarter of 2018, economic sentiment continues to run at an elevated level – well above its long-term average, consistent with ongoing and broad-based but more moderate economic growth in the EU. EU GDP is expected to grow at a lower rate in 2018 and 2019, supported by domestic demand but with net exports weighing down on growth. The greatest risks stem from rising protectionism and a further escalation of trade tensions and currency and stock market volatility in several emerging economies. EUROFER forecasts EU GDP growth of 2% in 2018 and of 1.8% in 2019.